f about ten lakh rupees to the needy. He is the first person in the world to spend the entire earnings for a social cause. In recognition to his service, United Nations Organization adjudged him as one of the Outstanding People of the 20th Century. An American organization honored him with the ‘Man of the Millennium’ award. He received a sum of Rs 30 cores as part of this award which he distributed entirely for the needy as usual.Moved by his passion to help others, Super Star Rajinikanth adopted him as his father. 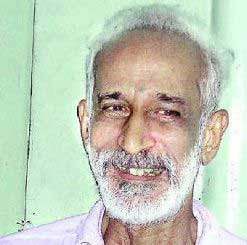 Kalyanasundaram was born and brought up in Melakaruvelangulam village, of Nangunari taluk in Tirunelveli district. "There were only 30 houses then. No roads, no buses, no school, no electricity, not even a petty shop. I studied in the light of a kerosene lamp or by candlelight till I was about ten years old," he says. The turning point in his life came when he was doing library science at the Madras University. That was when the Indo-China War was on. "I was listening to Nehru on the radio requesting us to contribute to the defense fund. Immediately, I went to Chief Minister Kamaraj and gave him my gold chain. I was probably the first student to have done such a thing," he says with pride in his eyes. Kamaraj was so impressed by the gesture that he felicitated the youngster at a special function on May Day that year (1963). For 45 years, Kalyanasundaram's social work focused on children. However, in 1998, after retirement, he decided to expand his service and, thus, Paalam was born. One of the first things he did was to direct the money he received as retirement benefit to social cause. Paalam serves as the link between donors and beneficiaries. Assistance is not only monetary. Children are helped in pursuing education, medical attention is provided to the needy, blood donation camps are organized and blood samples are reached to hospitals during emergencies, the unemployed, elderly, sick and handicapped are rehabilitated, and free counseling is provided. "I am a bachelor and my personal needs are meager. I am able to manage doing odd jobs in a hotel or a laundry. I simply do not wish to own anything. In fact, one of my happiest moments was when, after being chosen as the `Man of the Millennium' by an American organization, I donated the entire amount of Rs. 30 cores I received towards charity. Everything is, therefore, a state of mind. Finally, what do we take with us when we leave planet earth?" Kalyanasundaram wonders aloud!